One of my favorite things about doing a craft show is planning the display! I love seeing all my labored over pieces in one spot arranged in a creative and fun way. I’m only planning to do 2, possibly 3 shows this year in Nov. and Dec. but I’m already mulling over display ideas in my mind. Nearly every show I’ve participated in I’ve displayed my wares in a different way, but along the way, I've come up with some basic ideas that have stuck and worked well for me. There’s some controversy over this one, but I believe that in most circumstances, customers don’t want to walk into your space. I have a theory that they’re a) uncomfortable getting that close to a stranger… if you’re only talking 10x10 with a bunch of stuff, that’s definitely personal space and b) they’re lazy… they’ve come to the show to leisurely stroll not fight their way into a space already filled (and if it’s small, it only takes 1 or 2) with people while they try to avoid bumping into tables and getting caught up in hanging items. So if at all possible, set up your space with everything at the edges. If you have a product that may require any explanation at all, try to convey that in as simple manner as possible, preferably visually. Again, those lazy shoppers just want to see if anything catches their fancy, I don’t think most are there to scour through every booth trying to uncover your creative genius. For example, some people aren’t familiar with slings, so I have a mannequin (affectionately referred to as “Moi”) that I set up next to the sling rack with a baby doll in “her” sling and I hang pictures with 3M hooks on the rack of the various carrying positions. I also set up a restaurant style highchair to display a cart/highchair cover instead of expecting them to read about or inquire about what is in the adorable draw string sacks. One of my favorite newly acquired tricks is to raise my table. Amongst a sea of other tables, it’s a really great way to stand out and it brings your items closer to eye level… I’m telling you… you’ve got to cater to those lazy shoppers, don’t even make them bend over! You can pick up a set of those bed risers at a home goods store to stick under the legs of your table. Depending on how your table is configured, you may be able to extend the legs with PVC pipe, or if you’re feeling particularly creative you could even make your own PVC/plywood table. An added benefit is that it raises your table enough to display your banner there if you’re at an indoor show without a tent or if you’re using every other space for product display. I want my space to look like a little boutique transplanted itself there, not like a garage sale! If you head into a boutique, what sets it apart from say Wal Mart? The displays, the props, the fixtures. If you need a clothing rack and you’ll use it every show, invest in a nice looking professional one. You can get them on Ebay or at a local fixture refurbishing shop if you have one. If you see a shop having a going out of business sale ask about their fixtures. I got my waterfall rack that I display my slings on at a boutique that was moving to another location for $25. I also really love props! My favorites are a set of little nesting suitcases that are so versatile (hat boxes would work too). I can stack two or all three, have one open by itself, display things on top of a closed one and they double as storage. Discount stores like TJ Maxx and Marshalls always have interesting fabric covered boxes, there are lots of alternatives to the traditional and less stylish basket. Look around your house, I’m sure you have stuff you could use to create levels and help display products. I displayed some items in a little Euro styled children’s push cart at one show and have a super cute white feather table top Christmas tree that makes an appearance at every holiday show. I’m trying to be conscious of writing mini novel length blog posts (admitting you have a problem is the first step right? Seriously though, these wide margins make it appear even worse than it truly is!) so I’ll end it there. I hope those of you gearing up for the holiday craft show season found something useful here, have fun with it! Hi Ella Belle. My name is Becky and my blog name is SewBerrySpecial. 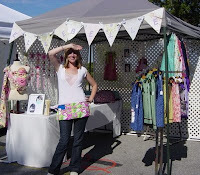 I am just starting to blog and do some craft fairs. I just wanted to thank you for some great displaying ideas. I love the tip about raising the table up. Great displays! I love the banner. I was thinking of making myself one too. I also like the sign...is it vinyl or canvas? Can you tell me where you got yours made? Thanks! Oh I am going to have to try and use some of these tips! 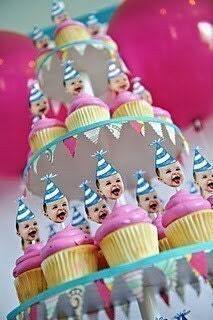 Good thing someone is making me an uber professional tablecover. I am going to have to get risers we used to do that in college all of the time. Thanks lazytcrochet! My sign is vinyl. I'm really fortunate that my Dad is a graphic designer, so he made the graphics for me and I had alwayssign.com make the actual sign. They have unbelievably cheap rates, a really quick turnaround, and I couldn't be happier with the quality! Thanks for the tips! 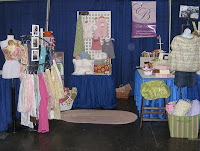 I have been thinking about craft show displays lately... always looking for new ways to stand out. Great tips - I'm going to look for table risers! Great ideas! Catching up on my blogs, and this is some timely information.